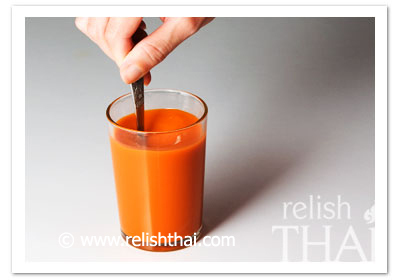 Thai Iced Tea is the most popular drink in Thai restaurants all around the world. The orange color has appealed people who love the sweet and creamy taste. Thai Iced Tea is even sold in some Vietnamese or Chinese stores and restaurants, although they have their own iced milk tea. Thai iced tea or Thai iced milk tea is called in Thai as “Chaa Yen” (ชาเย็น) and Thai iced tea is called as “Chaa Dam Yen” (ชาดำเย็น). Chaa Dum Yen is simply iced sweet tea without milk. 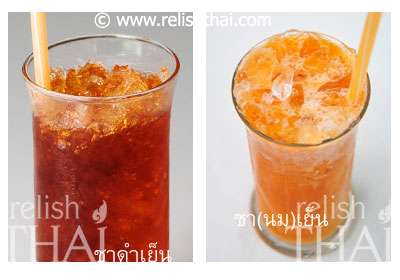 Today, we have 2 recipes of Thai Iced Milk Tea. The first recipe is the way how many Thai restaurants in foreign countries make Thai Iced Milk Tea and another recipe is the way how Thai Iced Milk Tea is made in Thailand. 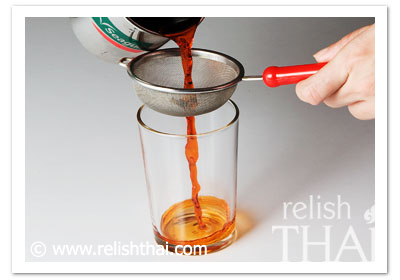 1)Pour boiling water into a cup of 2 full teaspoons of Thai tea. Stir well and let it steeps for 25 minutes or more. If you have a lid, cover the cup with lid for cleanliness and to bring the flavor. 2)Use a very good stainless steel tea strainer, a coffee or tea paper filter or a cloth filter (see the different results and comparison of each filter below) to strain tea leaves off. 3) Add 4 teaspoons of sugar and stir well. (If the tea is not hot enough for dissolve sugar, please warm it before adding sugar.) Let it sit for completely cooling down. After this step, you can store it in the fridge before serving and continue the next step. Adding 4 full teaspoons of sugar. 4) Pour tea into a glass of ice and top it with evaporated milk or half and half as much as you like. Note: Adding or reducing amount of sugar can be adjusted by preference. This recipe is very similar to the first recipe. The difference is only the step of making the tea sweet and more creamy (#3 step). 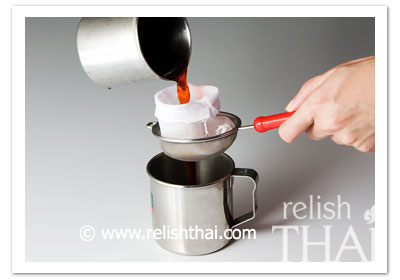 1) Pour boiling water into a cup of 2 or 3 full teaspoons of Thai tea (The amount of tea depends on how strong you like). Stir well and let it steeps for 25 minutes or more. If you have a lid, cover the cup with lid for cleanliness and to bring the flavor. 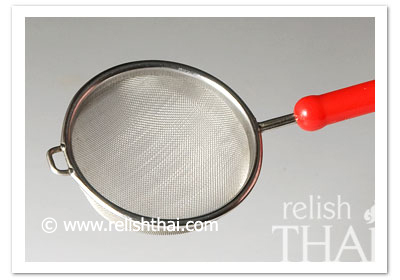 2) Use a very fine stainless steel tea strainer, a coffee or tea paper filter or a cloth filter (see the different results and comparison of each filter below) to strain the tea. Straining tea with cloth filter. 3) Add 2 teaspoons of sugar and stir to dissolve. Follow with 3 teaspoons of condensed milk and stir it well. (If the tea is not hot enough for dissolving sugar, please warm it before adding sugar.) Let it sit for completely cooling down. After this step, you can store it in the fridge before serving and go to the last step. Stir well. The tea is turned to orange with milk. 4) Pour milk tea into a glass of ice and top it with evaporated milk or half and half as much as you like. Topping with evaporated milk or half & half. 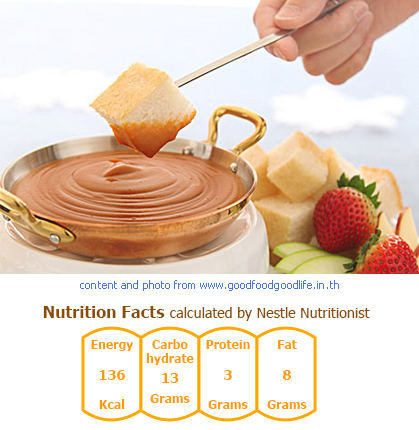 Note: Adding or reducing amount of sugar and condensed milk can be adjusted by preference. 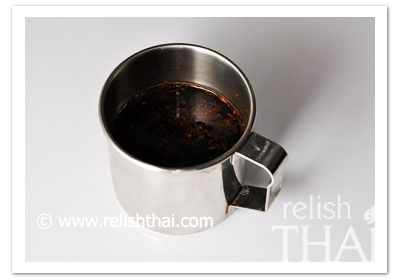 The heart of making Thai iced tea is that the stronger of flavor is, the better tea tastes. The reason is that the tea will be mixed with milk, sugar and ice; therefore, the taste of tea will be milder. If you make it mild, you will not taste tea. 1) Adding more tea leaves, this way will make the tea stronger but you have to use too much tea to do it. 2) Amount of boiling water should match with the amount of tea. Using too much water will weaken the taste of tea. 3) For strong tea, we recommend using boiling water to make tea and letting the tea steep at least 25 minutes for great flavor. You can let it sit as long as you want and if it is too cold after filtering the tea, you can warm it again. This is the same way when you steep a tea bag for a long time in a cup of water. Longer time of steeping the tea is, the stronger taste will be. 4) Use boiling water to make tea as the third solution. After filtering tea leaves, heat the tea on fire until boiling. Here, we will talk about three kinds of tea filters; stainless steel tea strainer, coffee paper filter and cloth filter. Using the different filters will give the different results. We have tried to use our regular stainless steel strainer (the first photo). From the second photo below, you will see that the result was not good enough to filter all the tea leaves. Some tea is still left at the bottom of the glass. However, if you have any high-quality filters, they will give you better result. Some tea still left after straining. 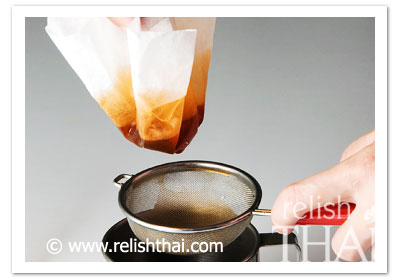 Standard paper filter for a drip coffee maker can be a choice of tea filters. As we tried it to filter tea leaves when the tea is not hot enough, it flows really slowly through the filter but you will get very fine tea. However, if you would like to make tea in high volume, the paper filter might not be a good choice. Warm tea flows very slowly through a tea paper filter. 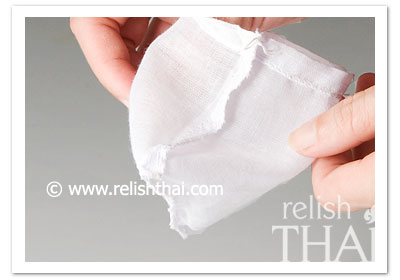 In the first photo, we show the small bag of cloth filter. 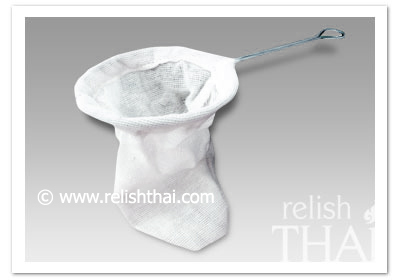 Mostly, the cloth filter with handle is used widely in Thailand and most Thai restaurants in foreign countries. The reason is it strains tea well and is good for making high-volume tea. Tips: To use cloth strainers, we recommend turning the stitches side out (like the picture above) for cleaning tea easier after used. Moreover, for long-time use of cloth strainer, you may simply wash by cold / warm water without dishwashing liquid. Before pouring tea into a glass of ice, keeping the tea in the fridge to make it cold is good for a cold drink like Thai Iced Tea because the cold tea will not melt ice too fast. 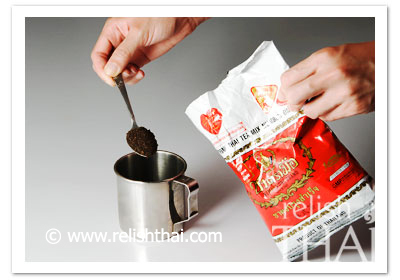 As same as using cold milk, this will keep the perfect taste of milk tea. 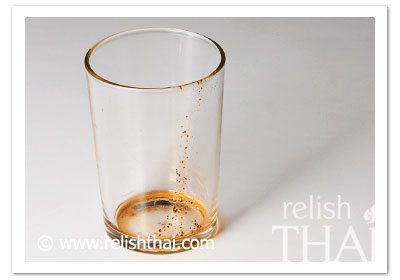 Another tip of serving the Thai iced milk tea is putting a straw in the glass before pouring milk. This will make the glass of iced tea looks nice with milk on the top.